I seldom offer a caveat at the beginning of a post, but please consider: All of the impressions below were OURS. The aspects of each campus that we considered positive might not impress you or your student, and our concerns might be strengths to someone else. But the intent of this post is not so much to ‘rate’ these schools as to share my experience accompanying my daughter on this once-in-a-lifetime journey. So here we go…. This time next year, our oldest child will be living on a college campus somewhere, leading her own life with a new level of autonomy, freedom, and responsibility. But the question is where? So this summer, my daughter & I set out on a 3-part road trip. We considered making this a family journey since her sister is only 2 school years behind and 5th grade brother is always up for going just about anywhere. But in the end, her mom & I agreed that this trip needed to be one parent-one rising senior, and we decided I would go. 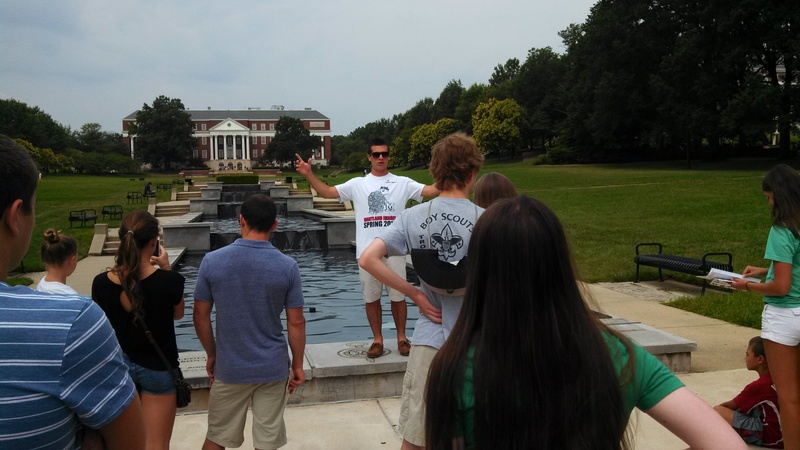 Then we started walking, touring dorms, classrooms, the library, and the student union–all of the usual college tour landmarks. Two resources that stood out along the way were the grammar hotline (Call from your dorm for help sorting out the wording of a paper?!) and the Math Success Program (free walk-in support with anything related to math). Why I will be glad if my daughter becomes a Terp: Maryland is a BIG school, a top-tier public university with world-class facilities, a wide range of entertainment options, easy access to opportunities in the nation’s capital, and as many majors as you can find anywhere. The size of the school offers options, enough options to allow any student to redefine him/herself several times over during a 4 year undergraduate experience. Bonus & Disclosure: I am a two-time Maryland grad, and I bleed red, white, black, and gold–a Terp For Life. Something to consider: College Park is a quasi-urban campus, just 15 minutes from Washington, DC. As a one-time commuter school that is transitioning into more and more of a residential school, Maryland experiences a constant ebb and flow of car and foot traffic with the neighboring community. Although safety is a concern ANYWHERE, I would worry more about my daughter more at UMCP than at some other schools–at least until I know she has routines in place to protect herself. A few days later we drove 3 hours or so to State College, PA. We stayed in a hotel the night before to ensure we would be on time for Spend a Summer Day at Penn State. To begin the day, we parked in the football stadium lot, then caught a designated shuttle bus across campus. We climbed out of the bus, walked through two lines of applauding students, high-fived the Nittany Lion, then walked into the largest lecture hall I’ve ever seen (even as a Maryland grad) for the welcome presentation. Then we started walking, taking the obligatory tour of campus. Two highlights were the writing center (the student gets help with the paper; the professor receives notice that the student took the time to seek help to do well) and the 6-tier dining plan (with options ranging from a light meal or two per day for students living off campus to what our guide called “the linebacker plan”). 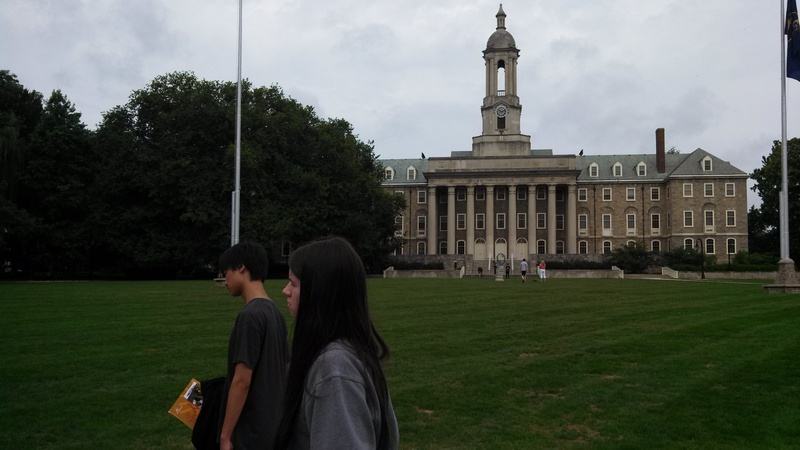 Why I will be glad if my daughter becomes a Nittany Lion: Penn State offers similar advantages to Maryland as another large, well-respected, public university. But what sets Penn State apart from other schools is the universal sense of identity and loyalty. The ‘summer day’ event was staffed by scores of volunteers who all appeared to be students and alumni, literally ranging in age from their teens to their eighties. University Park is also a more ‘enclosed’ campus than College Park; although the school neighbors a college town, there was little evidence of non-university traffic on campus. Bonus & Disclosure: We were familiar with Penn State because my daughter had stayed and played on campus for a Memorial Day weekend volleyball tournament 6 of the last 7 years. We both had stayed in dorms, eaten in dining halls, and walked the campus through those experiences. Something to consider: The dorms at Penn State, at least the older dorms that are most likely to house freshmen, are not particularly comfortable. Small, dark, lacking air conditioning–not posh. But a greater concern is that while freshmen are required to live on campus, housing is not guaranteed for all 4 years. The university has built relationships with local realtors and apartment complexes, but the possibility of needing to pursue this may be noteworthy for some students and their families. To be continued….In my next Dad Knows Better post: traveling south, some smaller schools, and why this trip matters in our big picture. This information helpful for me….Your great college search and road trip information very clear….